When members of Generation X began looking for their first jobs, the rules were pretty simple: print out your resume, visit local job fairs, call prospective companies, and even look through an archaic device, called a newspaper, for job listings. Now that Millennials are getting to the age ofpreparing for their first jobs, the rules have changed. Phone calls have been replaced by emails, newspaper job listings have been replaced by websites like Monster.com, and having a LinkedIn account is basically a cardinal rule for anyone expecting to be taken seriously by employers. Although modern technology has enabled more Millennials to stand out and discover more information throughout their search, the less-than-ideal economy has forced many job-seekers to get creative with what they've got. Generation X is used to a world where people only attend college right after high school and only have traditional institutions to choose from. Since the advent of online education peaked during Generation Y, these professionals know that higher education can take place anytime and anywhere. Some Millennials choose to opt out of traditional colleges to begin their careers and instead switch to online institutions. These more accommodating educational alternatives give professionals the opportunity to work toward degrees while building their own businesses. This path is fairly common for Millennials, since this generation ushered in the dawning of entrepreneurship, with idols like Mark Zuckerberg leading the way. The Harvard Business Review recently cited one especiallyinspiring story of entrepreneurshipwith Yuri Malina, whom the authors deemed a "MacGyver of Business." While a student, Malina co-founded an organization called Design for America (DFA), which is a grassroots network of self-described "creative activists" whose goal it is to create a positive social impact on communities throughout the U.S. Malina and his team studied the health care industry in depth to help solve some problems that affected the health and safety of certain hospitals. After observing the physicians and nurses at the NorthShore hospital in particular, Malina and his crew realized that most hospital employees weren't sanitizing their hands as often as they should, because of the inconvenient location of the sanitizing stand, and the busy schedules these professionals were following. In response to this observation, DFA patented a new invention called the SwipeSense. This innovative product would give medical professionals a more convenient and cost-effective outlet to stay cleaner and healthier in the hospital environment without interrupting their busy schedules. Although professionals in Generation X may feel like they'll never understand the Millennials entering the workforce today, the progression that these individuals have made is truly inspiring no matter what group you belong to. Based on the example set by Generation Y, Generation X can discover how to make education work for them and how to approach the job market on their own terms. 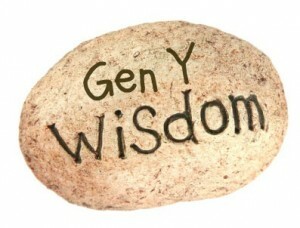 With technology within reach, Generations X, Y, Z and beyond have the professional world in the palms of their hands. @startmywebpage lovely and thanks for telling me =) what are you looking at? @karla_porter #seo is a big passion of mine so I’m always searching and analyzing! @startmywebpage that’s cool – are you following @NEPABlogCon?